Keeping your customers comfortable is simply done by having your facility set at the right temperature. If it is too hot or too cold, your customers will not even make it five minutes in your store, especially if it is too hot. We are here to help with your commercial heating and air needs. Home Mechanical works to get you back up and running to an even better condition than you were before. We believe in making your experience with us a memorable one. Therefore, we welcome any questions or concerns that you may have so that we do our job as efficiently as possible. At Home Mechanical we simply want to satisfy you so you can satisfy your customers. 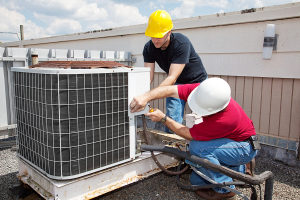 Our expert and professional technicians are prepared for any problem you may have with commercial air conditioning, no matter how many units you have. We specialize in repairs and installation for outside or central air conditioning. Home Mechanical will help with all of your heating and air needs. Your customers will be so comfortable; they won’t want to leave! Not only do we seek your satisfaction with our services, but with our prices. We understand you already have a multitude of expenses that comes along with running a business, so we want to solve your heating and air problems without burning a hole in your pocket. We believe in providing you with the most cost-effective AC that also has maximum quality, so we work to make sure the equipment you need runs long term. Therefore, we will install whatever you need to perfection and to your satisfaction. And if you only want repairs, we will make sure we get your units running like they are brand new. At Home Mechanical will make sure you have the innovative technology that is necessary to cool or warm your business environment with ease. We only want to offer you top quality machinery to where your HVAC system will run in excellent condition for the many days to come. We simply want to treat you how we would want to be treated. Don’t wait to fix your commercial heating and air needs! Call Home Mechanical today for a solution to all your HVAC problems.